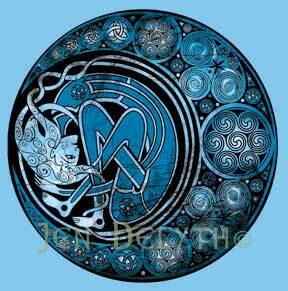 A Welsh Goddess, Arianrhod appears in the medieval story collection 'The Mabinogi'. She is ruler of Caer Sidi, a magical realm in the north. Arianrhod, whose name means 'Silver Wheel', was worshipped as Priestess of the Moon. The benevolent silver sky-lady come down from her pale white chariot in the heavens to watch more closely over the tides she ruled. The moon is the archetypal female symbol representing the Mother Goddess connecting womb, death, rebirth, creation. (Albion, the old name of Britain, meant "white moon"). In Welsh the constellation of Corona Borealis is named Caer Arianrhod - Arianrhod's Castle. The Celts "know well the way of sea and stars" and counted time not by days, but by nights, and made their calendars - such as the famous Coligny Calendar, not by the sun but by the moon.